Not evening aware of its existence, I recently accidentally stumbled up on the book The Best of Jim Coleman : Fifty Years of Canadian Sport from the Man Who Saw It All. I have to say I was wowed with the wide variety of not only hockey history, but sporting history witnessed and articulated by arguably Canada's most influential sports writer. The book is a collection of Coleman's best articles and columns from a career spanning over 50 years. The collection was put together by another of Canada's greatest sports writers, Jim Taylor. From Coleman's 2,500 columns, Taylor has selected stories about King Clancy, and Robinson before baseball's integration, about war ending and fish tales and bear tales and discovering, in 1943, that 1908 heavyweight champion Jack Johnson was on display in a freak show. Coleman's columns are a Canterbury Tales of sports as he introduces readers to colourful, odd characters, themselves often the storytellers in his columns. Amazon.ca says: Jim Coleman saw the Victoria Cougars win the Stanley Cup in 1925 and the Team Canada-Russia hockey showdown in 1972. He saw Lou Gehrig and Babe Ruth slam homers in training camp and was there when Jack Dempsey KO'd Jack Sharkey. He interviewed a young man named Jackie Robinson who wistfully dreamed of the day when black men might play in baseball's major leagues. From 1939 until his death at 89, Coleman covered every sport imaginable with eloquence, wit and an unfailing love that earned him a position as Canada's first nationally syndicated sports columnist, membership in five Canadian Sports Halls of Fame, the Order of Canada and status as the country's most beloved sportswriter. I'm a tunnel-visioned hockey fan. I honestly don't follow any other sports beyond a passive interest at best. So I skipped through much of the book looking for the hockey stories. There certainly are a number of gems to be found. He talks about Foster Hewitt in a 1939 column, recalls the "mighty" Sprague Cleghorn and Si Griffis in 1943 and Lester Patrick in 1949, and tells a hilarious story of a practical joke played on NHL president Red Dutton where a goose was placed in his hotel bathtub. "If you are a constant reader of the daily blats you will have observed that Frank "King" Clancy, the shillelagh-swinging Celt from Ottawa, is still slugging sundry citizens across the chops. King Clancy is acting in this bellicose fashion despite the fact that he has retired from active participation in the sanguinary sport of puck-chasing and has donned the uniform and attendant dignity of a National Hockey League referee." Out of the west one day roared that irrepressible fellow, Ivan "Ching" Johnson. Ivan, you will recall, was the large chappie who belted the bejabbers out of incoming forwards but always wore a wide and most pleasant-looking grin when performing those robust chores. Actually, his grin was a peculiar facial grimace and Ivan wasn't entirely the gentle soul that he appeared to be. Those who played alongside him will tell you that his lips curved back that way simply because he was grinding his teeth fearsomely and uttering threats to the enemy. "There are purists who will tell you that Gordie Howe is the peer of Richard as a hockey player. All of which probably is true and all of which, as far as I am concerned, is for the birds. Give me Maurice Richard and I'll fill every hockey rink in North America. Give me an entire team of Gordie Howes and I'll have the greatest hockey team in history - but how would they do at the box office? For a parallel with the case of Richard and Howe, it is necessary to take a look at baseball when Babe Ruth and Lou Gehrig were teammates on the New York Yankees. Manager Miller Huggins always said that, on a day-to-day basis, Gehrig was the better ballplayer. But it was the mighty Ruth who drew the spectators into the ballparks. Ruth was the Maurice Richard of baseball." Then there was his coverage of the 1972 Summit Series. For an idea of what he had to say back then, here's the four headlines from the articles in the book: Whose National Game? ; A Few Words From Captain Phil; One For All The Marbles; and Never A Doubt. 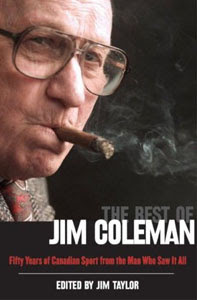 All in all, The Best of Jim Coleman is a fascinating book that sports fans from all genres and all generations can enjoy.